We are happy to welcome you and wish you a comfortable and friendly stay. 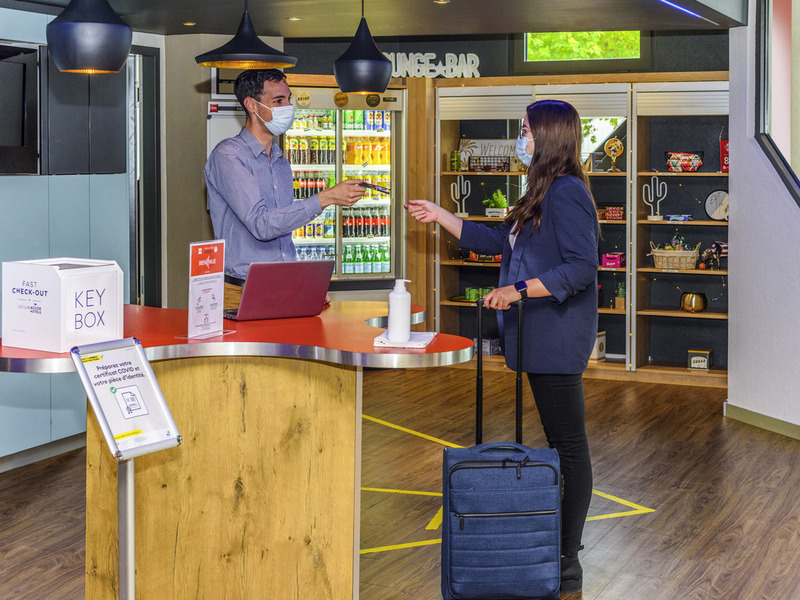 The ibis Lausanne Crissier hotel is located on the outskirts of Lausanne, 8 min by car from Lake Geneva and the Swiss Federal Institute of Technology, and close to the A1 and A9 highways. It offers spacious and comfortable rooms, conference rooms and a ba r serving snacks and drinks throughout the day. The Swiss restaurant serves freshly prepared dishes. We have a car park (paying, not reservable) and our guests benefit from a public transport travel card and free WIFI. Ten minutes from the city center. Web corner and free WIFI available throughout the hotel. Restaurant with freshly prepared food and world cuisine every Wednesday. Our restaurant offers a choice of typical Swiss dishes in a completely renovated new area. The warm and modern atmosphere reflects the new design and contemporary spirit of the brand. Want to stay connected and have a drink with friends? Our bar lounge area is waiting for you. I am a frequent user and am always satisfied with what Ibis offers. Comfortable and friendly. Ideal location for my purpose. Very professional staff both at the Reception desk and Restaurant. Excellent and large choice for a healthy breakfast.Convenient to have evening meals (not the case in every Ibis). If possible we will not return to an Ibis in general. I find that we get more comfort in a Mercure, Novotel and even an Ibis Style Hotel. We have so far only stayed in an Ibis in Paris and in the past many times at the Ibis in Crissier. I was hoping that the Ibis had updated their policy regarding towels, but to my regret they still only supply 1 towel per person for showering and this towel has now to last for 4 mornings. When there is no heating on towels don't dry and this experience is very uncomfortable. I took along my own hand towel just in case and I did need it. I would prefer to pay CHF 5.-- more to receive 2 hand towels as it is standard in all the other hotels. Another point is that their is a big construction site right next to the hotel. I think that the hotel ought to warn the guests in advance. Also did not like the self check-in and check-out. There is a big reception but nobody there. Guess Ibis is really only suitable when travelling on business, but not for leisure. On second thoughts, business people have the money and like comfort too. Location seems a bit lost in an industrial parc but actually only 15 Min from Crissier city centre which makes it practical if this is where you want to be. From Lausanne this isn’t very far away thus not recommended. Definitely great customer service from ALL employees (from the housekeeper to the waiter at the restaurant). Unfortunately the AC did not work well at our room and we could not fall asleep until 3 am when we called the lobby and they provided a fan. Also, the bathroom had a strong smell of cigarettes smoke. The hotel (classical ibis standard) is good, the position is not in the center but you've a bus that in 15 minutes reach the city center (last bus coming back midnight... quite frequent buses) and the ticket is included in the hotel price and obviously is cheaper compared to hotel in the city center (it's anyway expensive, but like everything in Switzerland). I hadn't breakfast in the hotel but in the nearby shopping center since also the breakfast was quite expensive. The Ibis Crissier was very pleasant. The staff were very helpful especially a young man who was serving at the bar (don't know his name but he told us he had worked in Wales/England for a time). This is the second time we have stayed here and would do again if ever this way. Lausanne is a lovely city especially down at the lake. There is a lovely park & lakeside walk in the Vidy area. the breakfast is so costly but with not a lot of varities. after giving an option of reaching early if you dont pay extra they will not let give you any rooms and and the same for checkout time, you have to pay 30 CHF for 2 hours. According to Ibis standard service. If you've already been to another Ibis hotel, this has the same level of service according Accorhotels policies. One point to improve is to offer more than one WiFi voucher per room, it is becoming more usual travel with more than one electronic device requiring WiFi. first time we had stayed there staff very friendly hotel modern hotel very clean and tidy shopping centre five minutes away to walk to food excellent and breakfast buffet well laid out and good choice. An IBIS hotel as it should be. We traveled by car and it is easy to find. Free parking and free public transportation is a plus. The hotel is in refurbishment during my stay therefore breakfast is too simple. I have been staying in IBIS Crissier for the last 4 weeks for business (you won't go there for pleasure!) and in general I would rate the hotel as a decent place for business travelers with access to commercial centre, close to the main road, etc. However, my last stay was not the best experience. Having stayed there continuously for the last 4 weeks one expects a personalised treatment which is missing. Due to non-availability and to get best rates I made 3 different bookings for the 4 nights and for the first night I got a room with special facilities for wheelchair access which meant that the working area was smaller and there was no room for the luggage, I checked my confirmation and it clearly stated that I had this type of the room so no complaints. Next night was a triple bed room which I confirmed and checked out in the morning. When I went back to the hotel in the evening, to my surprise I was given the same room back as last night and to my horror the room hadn't been cleaned. The reason cited was that there was a 'Do not disturb' sign on the door, which I distinctly remember I had taken out and left it on the floor while leaving in a hurry. Moreover I had checked out in the morning so the room should have been cleaned and guess what in the cleaner log it showed being cleaned. The lady at the reception was apologetic and tried to help but couldn't give me another room and I compromised. Had this happened in some other hotel I would have definitely had the manager or a senior staff member speak to me especially I have been a regular. I am not sure if this is a Swiss thing or specific to the hotel that I found them lagging in customer service. I have moved to Switzerland a year back and have seen much better service elsewhere in UK and other parts of Europe. I don't think this particular experience will put me off using this as I am expecting to travel there quite regularly but another one may just be the final one and hope they take note of improving the customer service. stayed for 1 night enroute from our holiday driving back home. We arrived at 10 pm without any advance booking but they were very helpfull to arrange for a room which was excellent, with good beds which was just what we needed after having driven for 900km. Very good hotel with plenty of parking, and easy access to the city centre. The room was in good working order and the bed was large though could have done without the plastic undersheet during a hot night. We were given transport tickets for the duration of our stay. We would stay again if our journey took us that way.